THE ASPARAGUS IN THE VENETO REGION CULINARY TRADITION The event will show case the asparagus, the king of the season. The event will be organized in buffet stations each serving asparagus cooked in different ways. The pairing with Tommasi Family Estates wines and live music will complete a magic evening. Unforgettable! The sixteenth century villa will be the setting of this unique and unforgettable event where the asparagus will be the king and the Tommasi Family Estates wines will be the perfect complement to the food. All recipes presented will be true to the Veneto region culinary tradition. There will also be a show cooking station where our Chef will finish off and serve the pasta dishes for a chance to exchange few words with the guests. Live music will complete the atmosphere and will make it very very special. 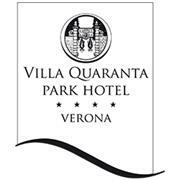 Located in a seventeenth-century villa between Verona and Lake Garda, Villa Quaranta Park Hotel is a 4 star hotel in Verona and the ideal place for wellness and business stays. Surrounded by the countryside of classical Valpolicella, a land of renowned wines and rich in history and tradition. It's a paradise for wine and food lovers. Villa Quaranta allows reaching various places in Veneto, Trentino, Lombardy, as well as the Lake Garda (a natural gym for surfers, yachtsmen and women, waterskiing and kite enthusiasts), the centre of Verona and famous cities as Vicenza, Padua, Mantua and Venice. Built around the half of the XVII century, the Villa is surrounded by the evocative parkland area and the landscape gardening of the Italian Garden. The Villa extends on three floors and displays the first Baroque trend signs, even though its overall architectural style is based on simple lines and a rigid central symmetry. Its windows and doors are embellished with cornices above which trapezoidal decorative elements are visible. The most interesting architectural feature is the central three-arched loggia located on the piano nobile (the lords' living floor). Inside the villa, there are a waiting room and a large hall with a vault ceiling - called Salone degli Zar ('The Emperors' Hall'). Both of them are decorated with wall paintings representing bench backrests. A marble staircase, featuring little angel plaster works, leads to the upper floor where the Loggia dell'Angelo and the Salone delle Arti are located. The Loggia dell'Angelo provides a beautiful view onto the park, whereas the Salone della Arti has frescoed representations of countryside scenes. The other rooms are named after people related in various ways to Villa Quaranta history. Finally, outside the Villa and near the entrance, a plate reminds of Alexander I Emperor of Russia.